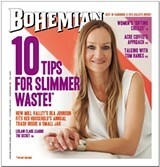 Bea Johnson's blog can be found at zerowastehome.blogspot.com. The Johnson family is labeled many things—extreme, obsessive-compulsive, privileged, entitled, out of touch, hypocritical, fanatic. Their minimalist Mill Valley home gets described as cold, void of personality, influence run amok and "as warm and welcoming as a bus station bathroom." So what did Bea Johnson—the public face of this family of four—do to deserve such vitriol? Did she shut down the government to keep low-income Americans from getting affordable health insurance? Did she bomb a village in Pakistan in the name of killing terrorists and maim a toddler? Not exactly. 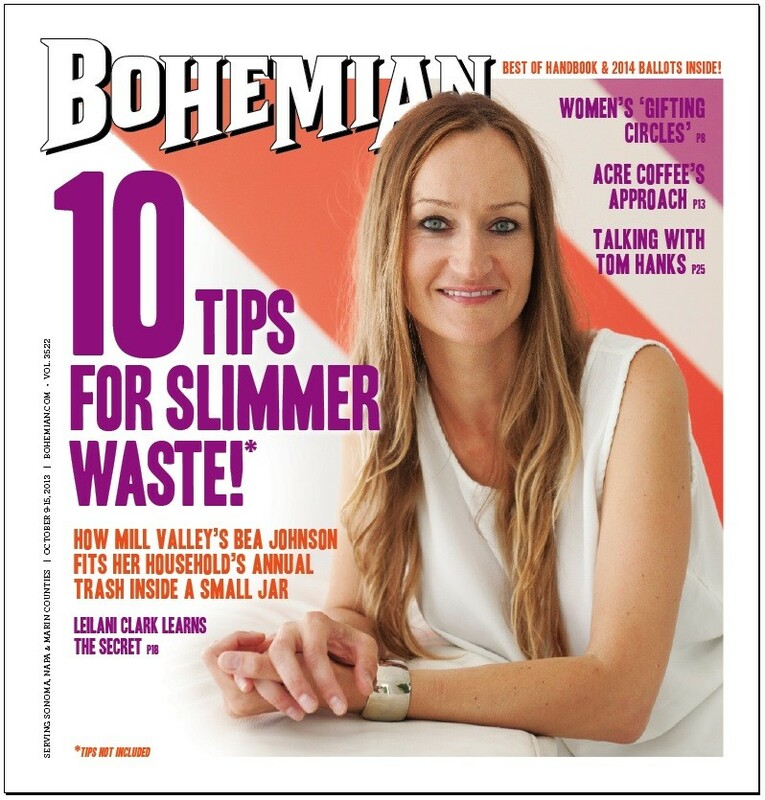 Johnson is the author of the blog-turned-book Zero Waste Home: The Ultimate Guide to Simplifying Your Life by Reducing Your Waste, the story of an eight-year journey to pare down a household's consumption to nearly a trickle. What Bea (pronounced Bay-ah) Johnson, along with husband Scott, a sustainability consultant and middle school- aged sons Max and Leo have done is minimized the waste stream leaving their house to such an extent that their yearly trash fits perfectly inside a quart-sized Le Parfait jar. They've done this by employing the 5Rs: refuse, reduce, reuse, recycle and rot. The money saved—a 40 percent reduction in household expenses since 2005, according to Scott's calculations—is what allows the family to stay in their 1921 two-level cottage in one of the Bay Area's wealthiest enclaves, says Johnson, brushing off suggestions that her lifestyle is a sign of privilege. "It's funny because people say, 'You're living minimalist because you're wealthy.' If we live minimally, it means we're not buying stuff and we're saving money." BASIC MATH Bea Johnson, who lives in Mill Valley, dismisses accusations of privilege: "If we live minimally, it means we're not buying stuff and we're saving money." During a tour of her home on a drizzly September afternoon, Johnson appears unfazed by the criticism, and, if anything, more energized by the challenge to share the aesthetic, environmental and economic benefits of the zero-waste lifestyle. Today, she's wearing an electric blue strapless dress (purchased at Goodwill) with a gold-colored necklace and black-heeled booties. It's one piece from an entire wardrobe that can fit into a carry-on suitcase. Seven pairs of shoes, two dresses, two skirts . . .you get the picture. To keep from buying new clothes and shoes, she's on a first-name basis with her tailor and her cobbler. "That's how Charles Ingalls did it," she says with a laugh. 'We're not telling people how to live our lives—that was never our intention," Johnson says, who's been critiqued for traveling by plane, driving a car (a used Prius) and depriving her children of Halloween candy and toys. 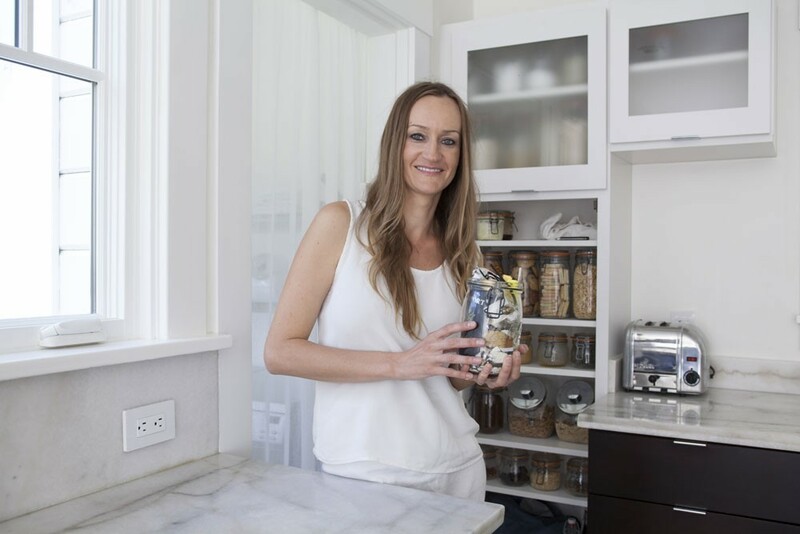 "The blog started because people were asking me how to do zero waste. If I didn't, it would be a waste of information. It's better to share what we know." Inside the house, the sparse, clean space is the culmination of a journey that began in 2005 when the Johnsons stopped buying big and started living small. Stepping into the living room, the first thing visitors notice is a severe lack of furniture or decoration, with the exceptions of a space-age looking hanging chair (currently occupied by a white Chihuahua), two white sectionals, a brightly-colored set of stripes painted across the facing wall and a living-plant wall. For those accustomed to houses crammed full of family photos, books, toys, plants, rugs and assorted tchotchkes, it's disconcerting. A deck with a view of Mount Tamalpais holds only a simple herb garden, a white patio set (bought second hand) and two Meyer lemon trees. Johnson mentions with a laugh how she encourages her sons to pee in the pot as a trick for making the soil more acidic. The kitchen counters are bare and the drawers hold only the most necessary of utensils—not even a vegetable peeler. Under the sink, instead of a trash can, sit two bins: one for recycling and one for compost. A meticulously organized pantry contains rows of glass jars filled with the basics: flour, sugar, pasta, grains. Upstairs, the two bedrooms contain only beds, a bookstand for each boy with one library book each, and a plant in the master bedroom. A family room holds a flat screen TV, a rug, a couple of electronic devices, some well-worn board games and four labeled crates filled with used video games and musical instruments.